OUR MSU: Our Voices. Our Struggles. Our Solutions. OUR MSU: Our Voices. Our Struggles. Our Solutions is a night of cultural empowerment. It will take place on October 9th at Erickson, Kiva. 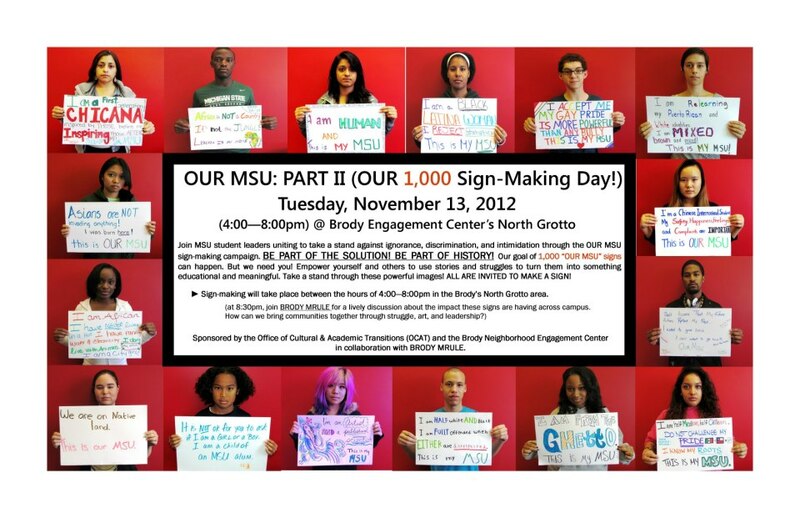 Join MSU student leaders uniting to take a stand against ignorance, discrimination and intolerance. It is not ok to make racial jokes. It is not ok to assume some students deserve to be at MSU while others shouldn’t. If you received an acceptance letter to MSU, this is your MSU too! We ALL deserve to be at MSU. Hear OUR Voices! Hear OUR Stories! We will NOT be silent! A night of Spoken word, inspiration, ART!, cultural desserts, celebration and solidarity! BE THE CHANGE…. Sponsored by the Office of Cultural & Academic Transitions (OCAT) in collaboration with Office of Inclusion, Asian Pacific American Studies Program, Culturas de las Razas Unidas and more! Photographs taken at the event (to help document this amazing event) have been generously donated by MIPC (MSU International Photography Club).